The rights afforded to EU citizens living in the UK, and UK citizens living in the EU, is one of the key topics in the Brexit negotiations. But what do UK citizens think about these issues? Presenting evidence from a comprehensive survey of British views toward EU free movement rights, Liisa Talving and Sofia Vasilopoulou illustrate that although the question of EU immigration is highly important to UK citizens, attitudes are much more nuanced and potentially contradictory than they might appear at first glance. One of the key priorities for the EU during the Brexit negotiations is safeguarding citizens’ rights. This refers to 3.5 million EU citizens living in the UK and 1.2 million UK nationals living in EU countries. The EU supports equal treatment in the UK of EU27 citizens as compared to UK nationals, and in the EU27 of UK nationals as compared to EU27 citizens, in accordance with Union law. In her Florence speech on 22 September, the UK Prime Minster, Theresa May, offered to incorporate legal protections for EU citizens living in the UK into UK law as part of the exit treaty. However, since the UK triggered Article 50 on 29 March, there has been little substantive progress in the Brexit negotiations with the question of citizens’ rights being one of the primary sticking points. A European Parliament resolution criticised the lack of sufficient progress on this issue, with the Parliament’s Brexit chief, Guy Verhofstadt, arguing that ‘citizens’ rights are not being well-managed’ suggesting the possibility of a potential European Parliament veto of the Brexit deal. What is the opinion of British citizens on the rights of EU citizens in the UK as part of the Brexit divorce? How do attitudes towards the rights of UK citizens abroad compare to attitudes towards the rights of EU citizens in the UK? Our sample consisted of 1,698 individuals and was representative of the general British population in terms of age, gender, education, social grade, region, political attention and EU referendum vote. We broke down the question of citizens’ rights into four subsequent components that relate to freedom of movement in the EU, i.e. the right to freely work, reside and do business in another EU member state, as well as receive welfare. Overall, British public opinion is dispersed on EU-27 citizens’ rights in the UK, as shown in Figure 1. There is much more support for doing business in the UK as opposed to working and living in the UK. The least support is observed on the question of access to welfare where we may observe comparatively much more disagreement and potentially a level of polarisation among the electorate. 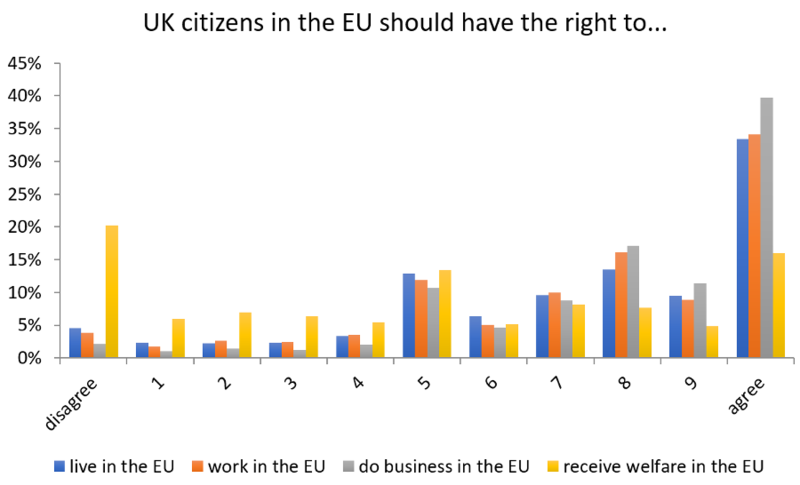 Figure 1: UK citizens’ attitudes toward the right of EU-27 citizens to live, work, do business and claim welfare benefits in the UK. On a scale from 0 to 10, where 0 denotes full disagreement and 10 full agreement, approximately a quarter of the respondents (24.16%) fully disagree that EU citizens should be allowed to claim welfare benefits in the UK. If we were to add those who have responded below 5, i.e. the middle point of the scale, then this proportion reaches 50% of the respondents. This shows that opposition to EU citizens’ accessing welfare benefits in the UK is much higher to opposition to EU citizens’ right to live, work and do business in the UK, which is at 20.84%, 19.57% and 9.25% respectively. Put differently, the majority of British citizens tend to be in favour of EU citizens living, working and doing business in the UK, but they are not as happy for them to claim welfare benefits in their country. How do these findings compare to how British citizens view their own rights abroad? Here the picture is slightly different. Figure 2 shows that on average British citizens are more supportive of their rights abroad compared to EU-27 citizens’ rights in the UK. 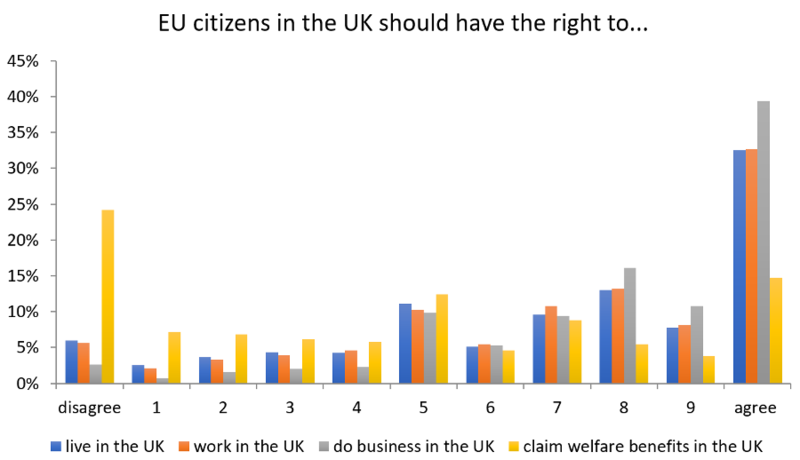 Overall, fewer people disagree that UK citizens should have the right to live, work, do business and claim welfare benefits in other EU countries (responses below point 5 on the scale). These percentages range from 14.74% disagreeing that UK citizens should have the right to live in an EU country, 14.04% being hostile to UK citizens having the right to work in the EU, only 7.74% disagreeing that UK citizens should be able to do business in other EU countries, and 44.9% arguing that UK citizens should not receive welfare abroad. The latter number on UK citizens’ welfare rights in other EU countries is about 5 percentage points lower than those who oppose EU citizens’ welfare access in the UK. That being said, however, British citizens are similarly polarised on the question of welfare access even if this concerns their own nationals abroad. Our findings suggest that although the question of EU immigration is very important among the public, and – as we know – contributed to how people voted in the Brexit referendum in 2016, it is much more nuanced and potentially contradictory than we had previously thought. First, often – at least in the British case – some nationals may have ‘double standards’ not viewing non-nationals having equal rights to themselves. This might undermine the UK government’s popularity following a Brexit divorce deal that guarantees equal rights for both UK nationals in EU member states and EU-27 citizens in the UK. Second, the British public is much more agreeable to EU citizens’ living, working and doing business in the UK, but they are considerably less comfortable with them sharing welfare. This suggests that it is the social aspect of EU citizenship that is the key issue featuring in the hearts and minds of the majority of the British public. This could be because the anti-EU campaigns, parties and individuals heavily politicised the welfare aspect of EU integration during the Brexit referendum, by for example associating EU membership costs with a deficit in the NHS. It might also be because citizens perceive a fundamental incompatibility between the transnational nature of the EU’s freedom of movement on the one hand and the national character of welfare states on the other. This might present another problem to the UK government given that EU-27 citizens that will remain in the UK post-Brexit will still have access to welfare. More broadly, to avoid potential spill over effects in other EU member states, the EU would need to address questions of welfare and access to welfare in the European Pillar of Social Rights. In addition to jobs and growth, one of the key priorities should be addressing the practical ways of ensuring fairness and equal opportunities across the EU without undermining citizen support for the EU. The right of family members to follow the first immigrant should depend on a language test. There is only a limited capacity to tolerate a parallel society who do not understand the local language – you do not want to pay the political price in xenophobia. Regarding benefits, a fair solution would be to let them depend on the time immigrants have contributed to the local system. I believe that it was unfair to the British population to pay premiums to immigrants. The immigrants were lured for economic reasons at public expense. Better subsidize the education in order to improve productivity.